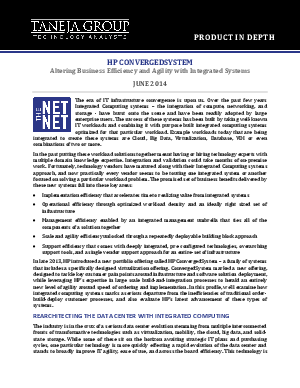 Integrated Computing (IC), also known as Converged Infrastructure, stands to revolutionize everything about IT. IC takes all of virtualization, storage, networking, and compute into a single system and allows total infrastructure oversight through one console. As you can imagine, the improvements in ease of use, agility, and efficiency are quite substantial. This is essential because infrastructure maintenance devours about three-fourths of annual IT budgets. IC changes all of that, delivering high efficiency solutions for the lifecycle of system,reducing costs and freeing up valuable personnel. The evolution of IT awaits.